Congratulations on choosing the first new generation FEA software since the 1960's! A core feature about MSC Apex is that there is no required training course to attend to learn how to use it. Follow these simple steps and you will be productive using MSC Apex on the same day! No other FEA software package is this easy and fast to learn. To see a complete end-to-end FEA simulation being done in MSC Apex, watch this next video. In the video below you will see how geometry is created, meshed, atributed with properties, constrained and loaded and then analysed. This is all there is to know to get up and running using MSC Apex! 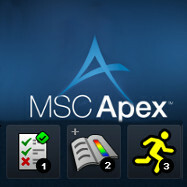 To download a trial version of MSC Apex, visit the official MSC Apex website. If you have any questions, don't hesitate to ask here in the comment section or send me an email: paul@simteq.co.za.